Data and the City is the first edited collection to provide an interdisciplinary analysis of how this new era of urban big data is reshaping how we come to know and govern cities, and the implications of such a transformation. This book looks at the creation of real-time cities and data-driven urbanism and considers the relationships at play. 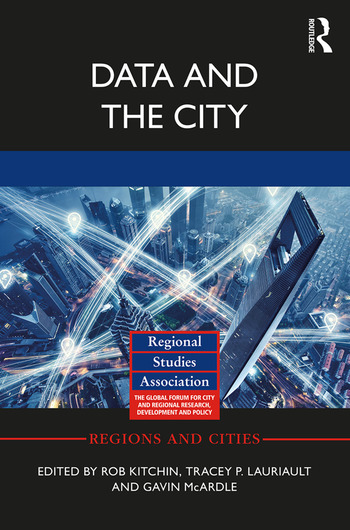 By taking a philosophical, political, practical and technical approach to urban data, the authors analyse the ways in which data is produced and framed within socio-technical systems. They then examine the constellation of existing and emerging urban data technologies. The volume concludes by considering the social and political ramifications of data-driven urbanism, questioning whom it serves and for what ends. This book, the companion volume to 2016’s Code and the City, offers the first critical reflection on the relationship between data, data practices and the city, and how we come to know and understand cities through data. It will be crucial reading for those who wish to understand and conceptualize urban big data, data-driven urbanism and the development of smart cities. Rob Kitchin is Professor and European Research Council (ERC) Advanced Investigator at Maynooth University, Ireland. He is also (co)Principal Investigator of the Programmable City project, the Building City Dashboards project, the All-Island Research Observatory (AIRO) and the Digital Repository of Ireland (DRI). Tracey P. Lauriault is Assistant Professor of Critical Media and Big Data in the School of Journalism and Communication at Carleton University, Canada. She is also Research Associate with the Programmable City project at Maynooth University, Ireland, and the Geomatics and Cartographic Research Centre at Carleton University. Gavin McArdle is Assistant Professor in the School of Computer Science at University College Dublin (UCD), Ireland. He is also Research Associate with the National Centre for Geocomputation (NCG) and the Programmable City project at Maynooth University, Ireland.